So I am in the process of just buying a bunch of bushings for my rear suspension and then replace them all at once when I have all the bushings. Mostly for a good refresher since they're pretty old and have a nice chunk of mileage on them. Now one of the last bushings I need is the toe arm bushing. There is a regular one and one that is offset using an eccentric sleeve for "bumpsteer reduction". 1. Is there a reason not to get the offset bushing and just get the regular one? 2. For the bumpsteer, it'll just reduce the amount of toe in/out under compression/rebound correct? Then flipping the eccentric sleeve increasing bumpsteer would do the opposite(more toe out and more toe in)? 3. Is there an easy way to get an idea how much bumpsteer you have(not super exact but just a idea gauge)? I'm thinking, could I just measure the toe the car static, then measure the toe after I jack the rear up a little bit(lets 3 inches) and see how much it toes out by? 1. If you need to correct a rear bump steer problem, get the offset bushings. If not, then don't. 2. Yeah, but that can be a big deal if your rear suspension is toeing out under compression. You really want to figure out what's happening and apply the appropriate fix. 3. You could get an idea of how much toe change you have under droop by jacking up the car and letting the rear suspension droop. And you could assume that the toe curve is similar on the compressions side. Toe change on droop probably isn't all that big of a deal. You're talking about the unloaded tire, so it's not going to do much. The loaded tire, on the other hand... if toe goes OUT more under compression, then as you load that tire, it's going to want to steer out more and more. If it doesn't cause oversteer, it's sure going ot FEEL like it's going into oversteer. I'm a little surprised that they make a rear bump steer correction kit for your car. Because I'm surprised that it has that problem. A well-designed suspension, especially if it's got wishbones as yours does, should have well-controlled rear toe. A Miata, for instance, has no toe change with suspension movement. You'll get a little toe-out under acceleration due to bushing flex, but nothing from suspension compression or droop. A simple beam axle, like on most FWD cars will toe IN under compression because it's essentially turning negative camber into toe. I guess they could have designed some "passive rear steering" into your suspension... and the act of lowering the car might increase that effect. I'd guess that would be like "some" rear toe out under compression by design, and maybe "a little too much" rear toe out under compression after you lowered the car. From research the bumpsteer does go out of whack when lowered and my rear is a nice chunk lowered. Other people do state they have problems when braking hard and the rear would get unstable and I do get that unstable feeling. They say the bumpsteer bushing fixes that. Since lowered, I did notice I have to give myself a little bit of room after braking for a slalom for the car to be settled. If I brake right before a slalom and start transitioning before the car is settled, my rear will be very tail happy. Or in a situation(look at map below for reference) where I am accelerating, curving to the left. If I apply the brakes hard in the area marked with the red square, my rear feels very very squirmy and unstable. I have to usually take that corner slower so I don't have to brake as hard. Doing a softer longer brake seems to keep the rear in composure rather than full on brakes. If the offset bushing would help a little with those situations then sounds like a good upgrade. Guess I kinda answered my own question if to get it or not. I can and have kept the car under control of those situations just by being a little earlier so it's settled. If it allows me to keep on the accelerator a blip more and if it helps keep the rear in check then sounds like the route to try. Now you've got me curious. You really ought to just remove a rear spring and do a full range of motion toe-change check. It sounds like maybe you've got toe-in under compression... which makes sense. High-powered car, you want it to be more stable under acceleration, and toe-in is stable. And if it's doing that, then it means that you're going more toe-out on droop. Depending on exactly where in the toe-curve this all happens... if you're actually getting into toe-out (or even right at zero toe instead of toe-in) under hard braking, then it could be part of what you're feeling. Or... it could just be the rear swaybar, springs and shocks making the rear end more prone to oversteer. Or a combination of the two. There are a lot of suspension problems that could have more than one solution. If you otherwise like how the rear suspension is working, it may be worth trying this to stabilize the rear under braking. Is your rear toe currently adjustable? And where exactly does this bump steer bushing fit in the suspension? 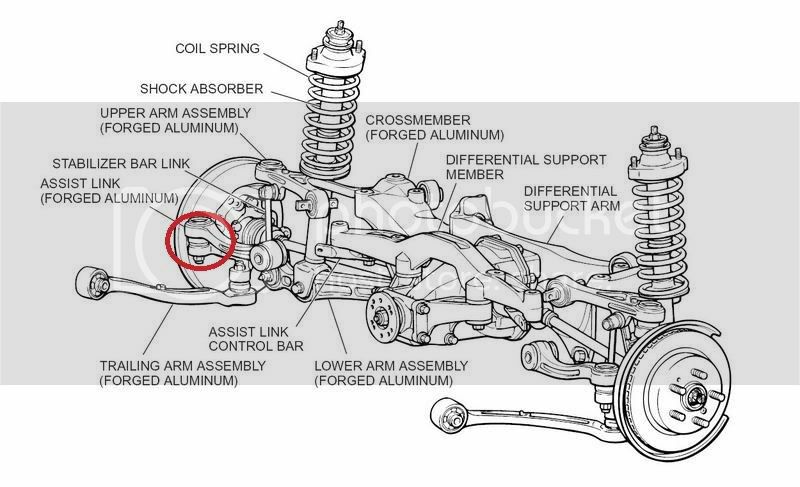 Need a diagram of your suspension to try to understand how it's going to work. And I need to split this thread. My rear toe arm is adjustable with an adjustment bolt. This is the rear toe arm with an offset bushing. Here is a diagram of the rear layout. Pictures make sense, you have lowered the car, so now you are raising the control arm mount to match the tie rod end relative to the ground. By design, the outer pivot point of that toe rod is higher than the inner pivot. This will make it toe out under droop. Lowering the car effectively raises that outer pivot point event more, putting you deeper into the toe-out curve. And if your toe is adjustable, you want enough static toe in that it keeps it from going past zero on droop. You can experiment with letting it toe out a little... But, a good stable starting point is toe in. At the moment I have 1/4 total toe in. I would like to have the rear be at 0 toe to just to give a little help with the rear rotation at low speed stuff. If I could figure out how to get very little toe curve or almost none when under compression/droop. Is that even possible? Can you fully get rid of the toe change or will there always be some? jbrannon7 wrote: Pictures make sense, you have lowered the car, so now you are raising the control arm mount to match the tie rod end relative to the ground. You'll get a better look when we replace all the bushings and what not at your place . It just depends on how much of a toe curve is built into that rear suspension. I would expect that it's designed to be minimal. But, when you lowered the rear of the car "a lot", you moved the center point of that curve so that it goes a lot more toe-out on droop, and probably doesn't go as much toe-in on compression. I don't think you could get rid of the dynamic toe without completely redesigning the rear suspension. Have you tried to limit droop? back in the Subi days we had some creative ways to limit droop since that wheel was unloaded anyway. as I recall we had about 3 inches of travel, total, by limiting it we could better manage bump steer and camber changes. I don't recall specifics, but that little turdhopper did out handle pretty much anything in IMSA GS class at the time..if we could've just kept the engine in it.